Kalagnanam(Kalajnan), literally meaning ‘Knowledge of Time’ was written by Sri Pothuluri Veera Brahmendra Swamy, who lived in Andhra Pradesh State of India, about 400 years ago and went in Jeeva Samadhi (entry into grave alive) (still alive and prosecuting penance in Jeeva Samadhi) at Kandimallayapalle (popularly known as Brahmamgari Matham (Mutt) (Lat. 14N50 Long. 78E50), in Kadapa District of Andhra Pradesh State, Bharat(India). Kalagnanam was written in Telugu Language and ‘Sandra Sindhu Veda’ on palm leaves, and Sri Veera Brahmendra Swamy’s sayings and ballads are being sung by wandering minstrels and mendicants. They are in the oral tradition. Most of his predictions have come true and rest is yet to come true. It is stated that Kalagnanam of the entire World contains 3,32,000 volumes. A small part of Kalagnanam is available in Brahmamgari Matham at Kandimallayapalle, Siddhayyagari Matham at Mudumala, Rangarajugari Matham at Nagaripadu, and the remaining major part is kept in the inner pit of Banaganapalle Mutt under tamarind sprout which has grown into a big tree now. 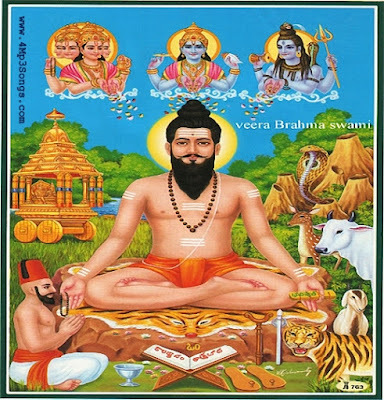 In every village and town of Andhra Pradesh, and in some parts of South India, we find a shrine in the name of ‘Brahmamgari gudi’and we don’t find a single person in Andhra Pradesh, who does not mention Sri Veera Brahmendra Swamy’s name and his Kalagnanam, at least once in his lifetime. His devotees call him as Jejinayana(Great-Grand Father) also. The impact of His Teachings and World predictions is beginning to be felt in other parts of India too and it would not be surprising if he and his predictions become internationally known very soon. Sri Veera Brahmendra Swamy wrote in his Kalagnanam that he was incarnation of Lord Vishnu and would come again as Lord Kalki/Lord Veera Bhoga Vasantha Raaya to restore dharma and peace on the earth. And devotees believe that he would rescue them whenever they plead him; and he will come out from the Jeeva Samadhi when the blood of thousands of people, who beheaded with frustration when the calamities reach peak stage, touches his Jeeva Samadhi. (It may be noted that like Lord Rama came to earth when Lord Parasurama is still in existence, Lord Veera Bhoga Vasantha Raaya came to earth while both Lord Parasurama and Lord Veera Brahmendra Swamy are still on the earth. The date of Sri Veera Brahmendra Swamy’s coming out from Jeeva Samadhi and of Lord Kalki/LordVeera Bhoga Vasantha Raaya is different).